Hi everyone! The new Creative Cafe' kit for April is full of so many great ideas, who knows where to start? 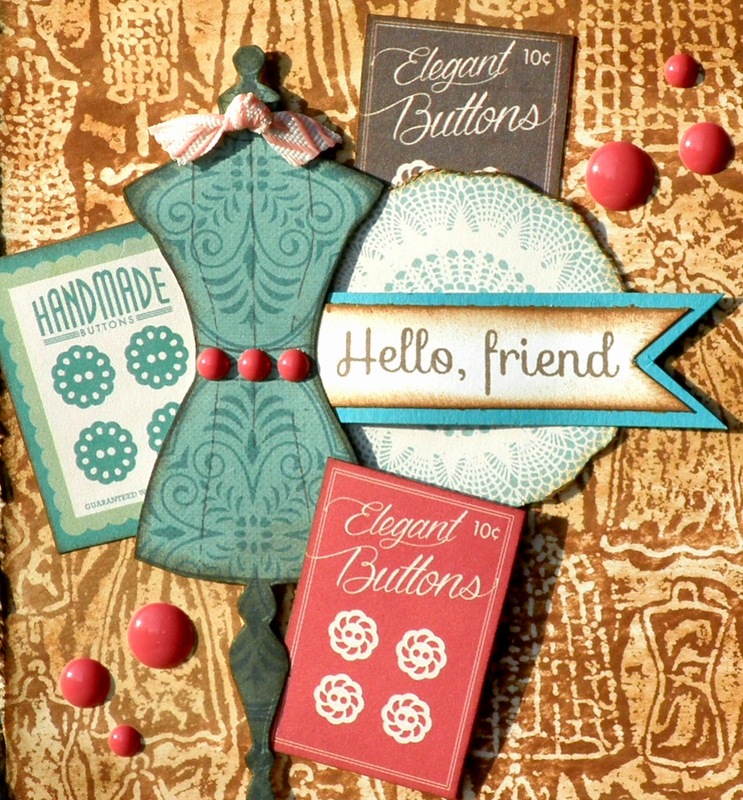 When I saw the vintage look of some of the papers and embossing folder, that's where I decided to start! You'll end up with the image on the left.....but then take a baby wipe and gently rub the surface....it cleans the ink off of the waxed background to leave you with the resist background on the right. Once you have this piece, I wanted more shabby chic, so I used Walnut Stain Distress Ink around the edges, and then distressed it using a Tonic Distress Tool. I tore it in the upper left corner for a little more interest. I used Scrap Happy Glue to put a small piece of lacy red pattern paper behind the tear, and then glued this all to the card base. The dressmaker form is stamped on white cardstock and on the aqua pattern paper using Black Tuxedo Memento ink. Fussy cut the entire image from the white, and the bodice only from the pattern. Glue together using Scrap Happy Glue. Distress with Walnut Stain ink. Cut out the button packs and doily from the pattern paper pack. Foam tape dressmaker form to the left side of card, arrange button packs and doily around and glue down. I used foam tape on the bottom button pack. 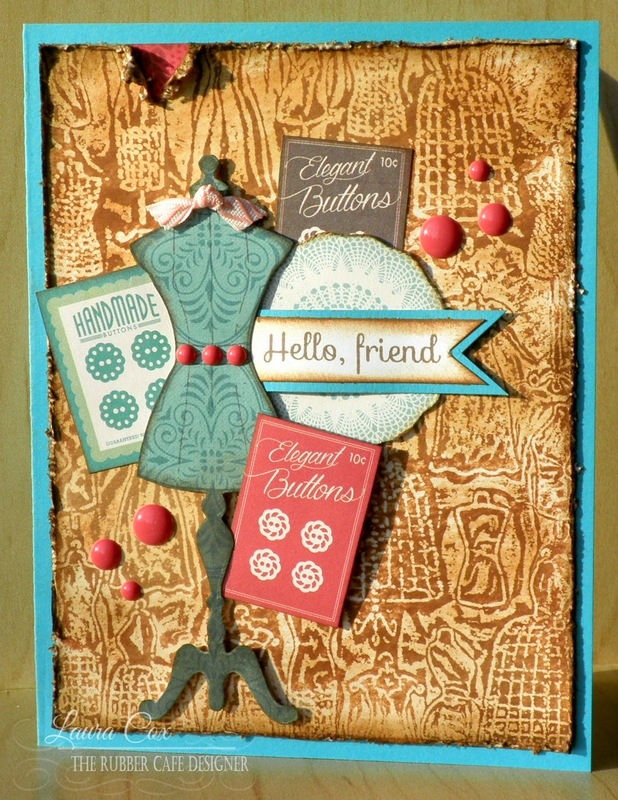 Stamp sentiment in Rich Cocoa Memento Ink on white cardstock, trim to a banner and mat on aqua cardstock. Add to center of doily. Add enamel dots and small bow to finish. Thanks so much for stoppin' by today! So much fun inspiration coming your way with this great new KOTM....make sure to stop back soon! What a cool technique! Definitely going to try this one! Wow! How cool is that?! And your card is wonderful!